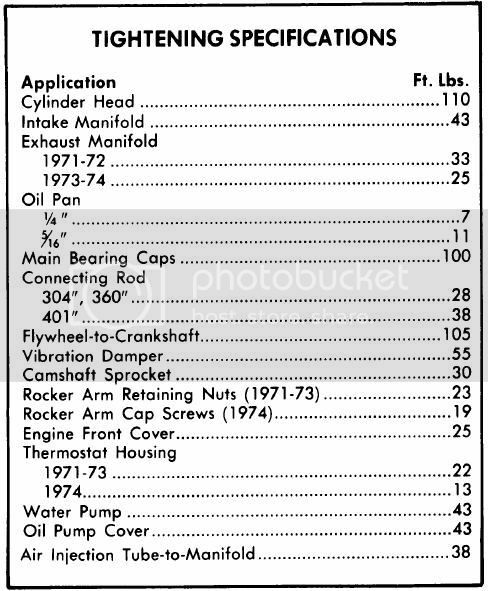 My old Chilton's list the head sequence for the 360 on AMC cars. It does not show Jeep in my book. Am I right in thinking this is the same engine as the AMX and the Madador? Has a belt buckle on the tailgate like a Gremlin. It is a little veg on the torque spec's. It say's 105 to 115. Doe's any one have the correct foot pounds for a 72 360 jeep head bolt? It's a 72 Jeep J4000. Is it true that these weight 5000 pounds? That's as much as a 71 Cadillac! You don't get service like that just anywhere!!! Ain't that a fact!! Chuck is real good about this kind of stuff as I've gotten info from him before on both my Geo and the Dodge when I had problems. Not too long ago Webber had some questions about a Dodge pickup truck that he was working on there in Moscow, Russia and Chuck gave him info on that one too. That's great. Thanks for the reply. Now can you come over and replace the gaskets for me. You went this far why not go the extra mile. This is actually a project for a couple of young twenty something kids that have been talking about an old car/truck project for years. I hope that they are not just a couple of dreamers. I told them I would just tell them how to do it and they could use my tools.